Tableau is a great tool. I've been watching it for a few years and I like the way it's developing -- more sophisticated computations, better performance, faster visual engine. Tableau aims at analysts without technical background -- an audience which probably is most under-served in terms of tooling than any other category of office workers. All what they usually have for their data analysis needs is Excel, love it or hate it. At the same time I struggled to understand the conceptual breakthrough behind Tableau. While it's often considered a prominent Data Discovery platform, when it comes to data transformation it's not significantly less dependent on IT staff than traditional Business Intelligence platforms. Just as traditional BI, Tableau needs well prepared data, preferably residing in a database. And when it comes to data manipulation in databases all user-friendliness ends -- last time when SQL was user-friendly was in 1980s. In my understanding the reason why Data Discovery started outpacing traditional BI is that it can liberate business teams from dependency on IT folks. Data Discovery tools must be self-sufficient by definition. It means that users should be able to collect, clean, transform and prepare data for analysis themselves. And this is why they still love Excel -- because it makes it possible, because it lets them control. And that's why QlikView is more self-sufficient -- because it has its own ETL. While QlikView has its own pros and cons (personally I'm not a big fan of its loading script), but in vast majority of cases it has all you need to prepare data for analysis and visualization. But what about Tableau? I've designed EasyMorph, an easy-to-use ETL tool intended for exactly the same target audience as Tableau -- knowledge workers without a technical background. Like Tableau, EasyMorph is highly visual and it doesn't require SQL skills or programming. Like Tableau, it's fast and lightweight, and it doesn't demand weeks of training. My goal is to make EasyMorph a perfect companion for Tableau and allow Tableau to become a truly Data Discovery platform, owned by business users. Today EasyMorph made one more step towards that goal -- we've added support for Tableau Data Extracts. If you're a Tableau user, give EasyMorph a try -- maybe this is something that you were missing in your Tableau experience. Feel free to drop me a few lines with your thoughts on it. You can find my email in the right sidebar of this blog. Thank you! 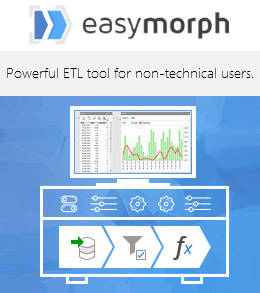 In 2015 EasyMorph has become a Tableau Technology partner. It has got a server edition and deeper integration with Tableau Server. Apparently Tableau understands the lack of built-in data preparations capabilities -- in October 2017 they've unveiled Tableau Maestro, a light-weight data preparation tool. You can think of EasyMorph as "Maestro on steroids".